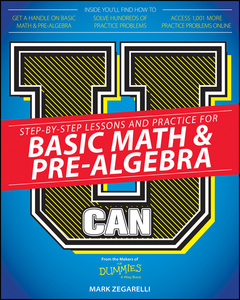 U Can: Basic Math & Pre?Algebra For Dummies is the fun, friendly guide to making sense of math. It walks you through the "how" and "why" to help you master the crucial operations that underpin every math class you?ll ever take. With no?nonsense lessons, step?by?step instructions, practical examples, and plenty of practice, you?ll learn how to manipulate non?whole numbers, tackle pesky fractions, deal with weights and measures, simplify algebraic expressions, and so much more. The "learn it ? do it" style helps you move at your own pace, with lesson?sized explanations, examples, and practice. You also get access to 1,001 more practice problems online, where you can create customized quizzes and study the topics where you need the most help. Believe it or not, math can be fun! And the better you understand it now, the more likely you are to do well in school, earn a degree, and get a good job. U Can: Basic Math & Pre?Algebra For Dummies gives you the skills, understanding, and confidence you need to conquer math once and for all. U Can: Basic Math & Pre–Algebra For Dummies is for students who need help with their foundational math skills and want a complete product to help with coursework. Parents will find this a useful tool for helping their children with math and pre–algebra homework, too. Mark Zegarelli is a teacher, tutor, and cofounder of Simple Step Learning (simplestep.co), a web–based educational resource.